When I was much younger (obviously a long time ago! ), I was amazed to learn that you can actually see another galaxy with your own eyes, without any optical aid (though I do need to wear my specs nowadays!). 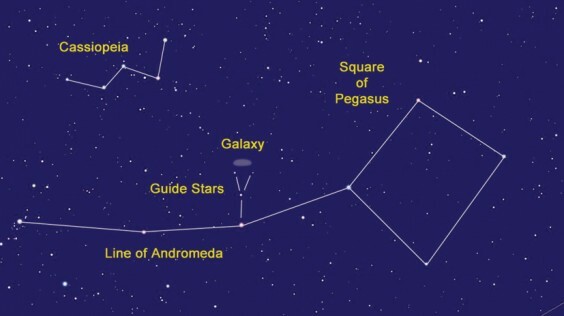 As ever, you will need to get away from the street lights, but once there, look high to the south east to find the very obvious four stars of the square of Pegasus. Higher still is the crooked W of Cassiopeia. The upper right star of the square is Scheat and it is a Red Giant, nearly three hundred times the size of our Sun. In common with most Red Giants it “pulses” so its brightness varies and it will, at some time, explode in a supernova. It appears as just a misty patch and, at 2.5 million light years away, is considered to be the most distant object that can be seen with the naked eye. Binoculars will give it more form and this is the best way to see it, but do sit down to avoid falling over backwards! Nearer home, you should still be able to watch Venus creeping along just above the horizon but you only get about half an hour from about six o‘clock. Look for it in the glow of the setting Sun, especially on the 2nd when a thin crescent Moon will be nearby. Saturn lies between the two but will be harder to spot this close to the Sun. In the same place in the sky about an hour later, Mars is slowly fading as we race away from it, but should still be easy to find thanks to its distinctive colour. The Leonid meteor shower peaks on the night of the 17th but although this is usually one of the brightest, it will be fighting a very bright Moon which is full on the 14th.